Hey friends! I have some things to share, and I’m going with the most effective list format…. • I’ve been oohing and ahhing over the Chevron Scarf Flickr group, and then while fondling my sock yarn I came up with a color combo that does it for me and I got started. I did have a hard time though deciding between the Chevron Scarf or Domesticat’s version, but last night at knitting group the votes were quite clear for the Chevron scarf. • Rainbow Brite socks. Another love yarn, just look at it all wound up. But I was having some concern about the starting color being green. I really didn’t want green toes. In an ideal world my toes would be red, because the rainbow starts on red and that seems to make sense to me. But red couldn’t happen with out some serious surgery to the yarn. But the teal and lt blue seemed better to me then green for some reason, so I did some manual striping, but now I’m not sure because the strips are much narrower (I split the colors in half to have equal amounts for each sock). So I need to make a decision: A)have green toes B) leave as is with narrower beginning strips of teal and lt. blue C)Scrap the teal toe and just go with one narrow strip of lt. blue OR D) perform massive reconstruction of the yarn ball and have red toes. So what do you think???? • Tiger Socks . Gauge gone wild here. The label suggests 6.5sts/in on size US 2 (3mm), but the fabric feels to loose for me even thought I was getting about 6.5 sts/in. So I went down to US 1 (2.25mm) and was getting about 9.5sts/in. So here’s were that pesky Knitpicks sizing thing gets into play (quite similar to Ashley’s). So I’ve ordered some of the new lace Addi’s in US (2.5mm) hoping for that middle ground. And this does not change my love of my Knitpick needles. I think it’s kinda great that the sizes of Knitpicks is different than the Addis, because it will just take a few purchases now to have all US & MM sizes covered! Also a side note: Please! Please! Please! 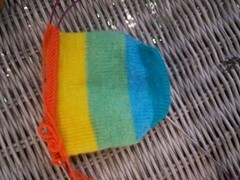 Let mine knit up like these (the link will also take you to a sale of 50% off making it $3.50 a ball. )Oh and p.s.s. I love this yarn. It’s soo soft and the elastic makes nice and stretchy, but not too stretchy. 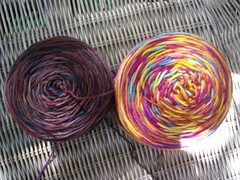 • So while I was knitting up Trekking 100 swatchies, I decided that I will at least need 2 balls and I only had one. And while I was looking for more I found this. 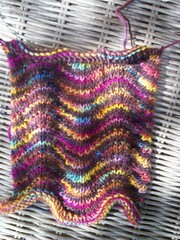 Colorway 100 in DK weight! Woo-hoo! So I’ve ordered enough of it to make a Clapotis. • And while browsing at Astrid’s I found this. OH MY! I’ve been drooling over the sweater at Purlwise with this mysterious Kauni yarn. And since my love of the Entrelac scarf had not faded, I decided this would be perfect! I am beyond excitement about this! • So I’m usually a 1-2 project at a time kinda gal, and I normally hate leaving something un-finished. But I’m not even feeling guilty about abandoning the CPH and starting 3 new things and planning immediate action another 2. I’ve come up with some excuses reasons for this. It’s better to love what your knitting (and I am loving every single one of these to pieces!) and I’m gonna wait for Becky to finish her CPH (and start, heehee) so she can be a part of our Knitter’s in the Hood photo. • Oh and I almost forgot, I’m very excited about this too! The rainbow socks are pretty. Leave them the way they are, they are fab! You’re up to a whole lot of knitting! 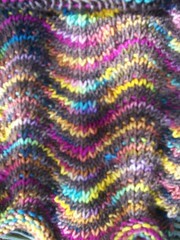 Thanks for sharing the little knits website link. Chevron things are popular right now, scarves, blankets… and yours looks great. I love the colors. So many great links, it was hard to choose where to go first! I love your final choice for the Chevron Scarf, just what is that yarn? It looks beautiful!! Oh how the rainbow makes me happy! 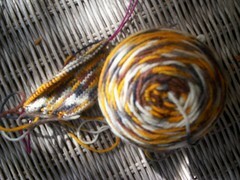 I happen to have that tiger sock yarn for one of my sons & it’s a fantastic sock yarn for the price. It’s so fun to have found a semi-local, it’ll be nice to actually meet someday. 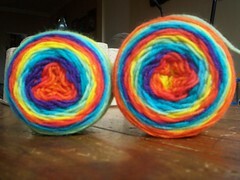 That Rainbow Brite yarn is amazing–my mother would love it. And I think you’ll like having several projects going at once. Sometimes you need to step out on your main project just so you can go back to it. I’m a promiscuous knitter and proud! I Love You and wish you a Happy Mothers Day!! By the way… your slackin’ I read this post three times last week! Oh well… I guess if I can’t get enough of you I will just have to read it again! Love ya, Happy Mothers Day! I hope you had a wonderful Mothers’ Day. Oh…yeah I have a blog!